Imagine an airport. What are the first things that come to mind? A cavernous terminal, information displays, long queues, baggage claim conveyors, arriving aircraft waiting to be fueled and catered for imminent departure. Airports have a tight flight schedule with its associated staff management, passenger processing, attention to minute detail, and much more. Airport automation speeds up the processes and improves the quality of service. We have addressed best practices for modernizing airline operations and put our talents to work for Merlot Aero advance airline management. In this article we will take a detailed look at main airport operations and the ways integrated software solutions can facilitate them, as well as describe some integrated airport management suites from key vendors. Our article consists of two major parts: a general overview of key airport operations, and the description of some of the most widely used solutions on the market. If you know the basics, just skip the first part and go straight to the second one. Before we learn about the software, let’s start with the main airport operations. They can be divided into four types: landside operations, airside operations, billing and invoicing, and information management. Landside operations are aimed at serving passengers and maintenance of terminal buildings, parking facilities, and vehicular traffic circular drives. Passenger operations include baggage handling and tagging. Terminal operations comprise resource allocation and staff management. Airside operations include aircraft landing and navigation, airport traffic management, runway management, and ground handling safety. Billing and invoicing operations cover aeronautical and non-aeronautical revenue. Ledger or accounting systems contain information regarding airport finances: flight bills, handling invoices, cash, sales within the airport (points-of-sales), staff payrolls, etc. Information management relates to the collection and distribution of daily flight information, storing of seasonal and arrival/departure information, as well as the connection with airlines. Airport management systems, as airport software is often called, serve to optimize all these operations: passenger processing, baggage tagging and handling, arrival/departure operations, departure control systems, information distribution, and air traffic control (ATC). Airport software can also include other solutions, like CRMs and environmental management systems. Let’s take a closer look at the modules of airport management software. Airport management systems usually have most of the following modules, but they are not limited to them. Each airport has its own central database that stores and updates all necessary data regarding daily flights, seasonal schedules, available resources, and other flight-related information, like billing data and flight fees. 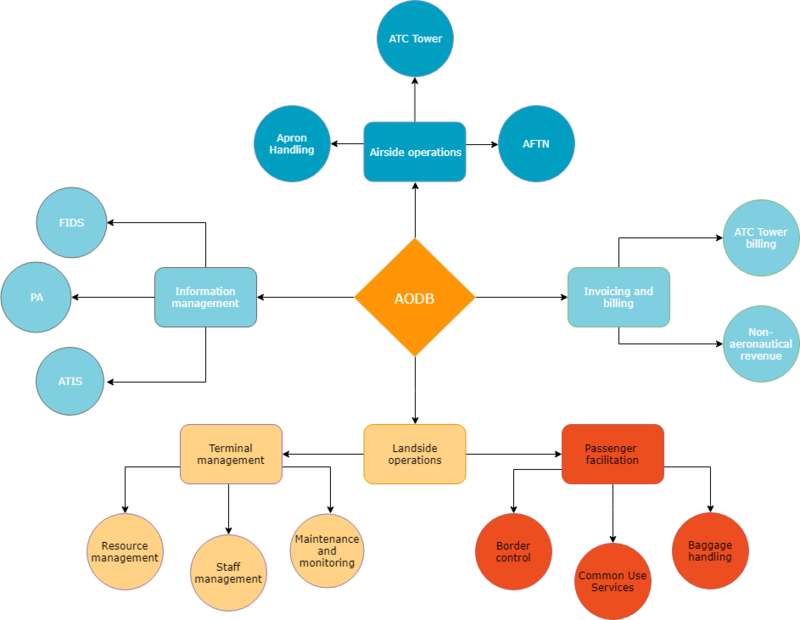 AODB is a key feature for the functioning of an airport. This database is connected to the rest of the airport modules: airport information systems, revenue management systems, and air traffic management. The system can supply different information for different segments of users: passengers, airport staff, crew, or members of specific departments, authorities, business partners, or police. AODB represents the information on a graphical display. The most important information that this database holds is the seasonal schedule. It displays information about commercial flight movements for a season. Usually, it contains the flight code, type of aircraft, their estimated arrival and departure times, multi-stop flights, operation days of the week, exception dates, and other relevant information. This information entered manually or downloaded allocates such resources as arrival or departure gates, air-bridges and stands, check-in desks. While AODB stands alone and doesn’t belong to any operations, it is the backbone of the airport. Information stored in AODB facilitates the planning and allocation of the physical and financial assets of an airport. Software providers: SITA, Rockwell Collins, NEC, ISO-Gruppe. Operations performed by this module include terminal operations and airline departure control: passenger check-in, customs, baggage handling, screening, etc. Some airports have automated biometric control. Passenger data is integrated into the border management system that allows the appropriate personnel to check a passenger in the databases. Let’s look at the services integrated into the airport management software. Passenger facilitation services include passenger processing (check-in, boarding, border control) and baggage handling (tagging, dropping and handling). They follow passengers to the shuttle buses to carry them to their flights. Arrival operations include boarding control and baggage handling. Border control (customs and security services). In airports, security services usually unite perimeter security, terminal security, and border controls. These services require biometric authentication and integration into government systems to allow a customs officer to view the status of a passenger. Baggage handling. Obviously, a passenger must check a bag before it’s loaded on the aircraft. The time the baggage is loaded is displayed and tracked until the destination is reached and the bag is returned to the owners. Common Use Services (self-service check-in systems). An airport must ensure smooth passenger flow. Various digital self-services, like check-in kiosks or automated self-service gates, make it happen. Self-service options, especially check-in kiosks, remain popular. Worldwide in 2018, passengers used kiosks to check themselves in 88 percent of the time. Terminal management. The software Includes maintenance and monitoring of management systems for assets, buildings, electrical grids, environmental systems, and vertical transportation organization. It also facilitates staff communications and management. Staff management. Staff modules provide the necessary information about ongoing processes in the airport, such as data on flights (in ICAO or UTC formats) and other important events to keep responsible staff members updated. Information is distributed through the airport radio system, or displayed on a PC connected via the airport LAN or on mobile devices. Reporting. This module allows the staff to see data on screen or in print to understand the effect of the ongoing processes on business decisions and overall functioning of the airport. Also, it can include reports from airlines, aircraft, operators, hourly activity of passengers and aircraft, movement types, etc. They include an aircraft’s timetable, routes, and destinations, as well as traffic distribution. Airside operations comprise control and facilitation of aircraft handling and parking. This includes air traffic control equipment and management solutions for air navigation. Most airside solutions are oriented toward aeronautics and plane allocation. Aeronautical Fixed Telecommunication Network (AFTN) Systems. AFTN Systems handle communication and exchange of data including navigation services. Usually, airports exchange traffic environment messages, safety messages, information about the weather, geographic material, disruptions, etc. They serve as communication between airports and aircraft. Air traffic management is performed from an ATC tower. ATC Tower. The Air Traffic Control Tower is a structure that delivers air and ground control of the aircraft. It ensures safety by guiding and navigating the vehicles and aircraft. It is performed by way of visual signaling, radar, and radio communication in the air and on the ground. The main focus of the tower is to make sure that all aircraft have been assigned to the right place, that passengers aren’t at risk, and that the aircraft will have a suitable passenger boarding bridge allocated on the apron. The ATC tower has a control room that serves as a channel between landside (terminal) and airside operations in airports. The control room personnel are tasked with ensuring the security and safety of the passengers as well as ground handling. Usually, a control room has CCTV monitors and air traffic control systems that maintain the order in the terminal and on the apron. Apron Handling. Apron or ground handling deals with aircraft servicing. This includes passenger boarding and guidance, cargo and mail loading, and apron services. Apron services include aircraft guiding, cleaning, drainage, deicing, catering, and fueling. At this stage, the software facilitates dealing with information about the weight of the baggage and cargo load, number of passengers, boarding bridges parking, and the ground services that must be supplied to the aircraft. By entering this information into the system, their costs can be calculated and invoiced through the billing system. Each flight an airport handles generates a defined revenue for the airport paid by the airline operating the aircraft. Aeronautical invoicing systems make payment possible for any type and size of aircraft. It accepts payments in cash and credit in multiple currencies. The billing also extends to ATC services. The data is entered or integrated from ATC. Based on this information, the airport calculates the charges and sends the bills. Revenue management. Non-aeronautical revenue management systems are comprised of accounting systems, business intelligence, payrolls, and revenue from ground handling services in airports. Software providers: Rockwell Collins, Siemens, Ultra Electronics Holdings, Amadeus IT Group, SITA. This category includes all types of software that collect, distribute, and update information from around the airport, including public address systems and flight information display systems (FIDS). They receive data from airlines and terminals, data on time and gates of arrival that must be sent to the passengers. However, they also can display marketing information or any other non-flight-related types, for example, weather or news broadcasts. Airport information systems include flight information display systems (FIDS), airport announcement or public address (PA) systems, and automatic terminal information service (ATIS). Flight Information Display Systems (FIDS) exhibit the status of boarding, gates, aircraft, flight number, and other flight details. A computer controls the screens that are connected to the data management systems and display up-to-date information about flights in real time. Some airports have a digital FIDS in the form of apps or on their websites. Also, the displays may show other public information such as the weather, news, safety messages, menus, and advertising. Airports can choose the type, languages, and means of entering the information, whether it be manually or loaded from a central database. Airport announcement systems or public address (PA) systems inform passengers and airport staff about any changes and processes of importance, for instance, gates, times of arrival, calls, and alerts. Also, information can be communicated to pilots, aircraft staff, crew, etc. PA systems usually include voice messages broadcasted through loudspeakers. Automatic Terminal Information Service (ATIS) broadcasts the weather reports, the condition of the runway, or other local information for pilots and crews. 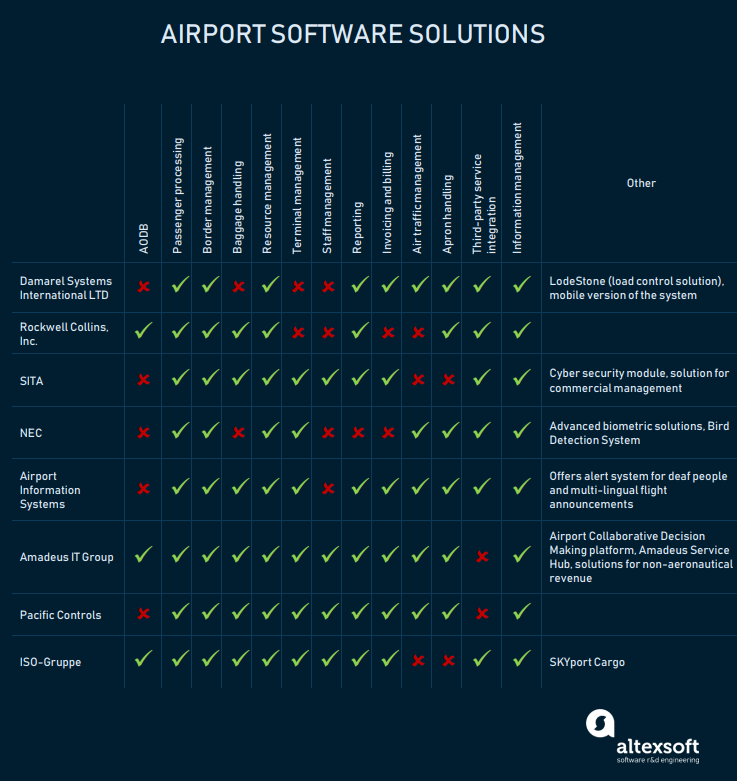 Some airport software vendors offer off-the-shelf solutions to facilitate particular tasks, like maintenance, or airport operations. However, most of them provide integrated systems that comprise modules for several operations. Let’s look at some of them. A small travel disruption can have significant consequences. As the airport is a large structure that requires tracking, processing, and maintaining many procedures at once, integrated solutions can be a good choice for management contrasted with multiple software programs jumbled together. Damarel Systems International offers software solutions for airlines and airport operations. Airport software solutions cover passenger processing, ground handling, and information systems. Additionally, the vendor offers border control solutions Vanguard and Aura, a passenger boarding solution Embark that supports self-boarding gates and its mobile version EMBARKmobile, load control solution LodeStone, and a middleware solution Babel ZIP that enables native airline applications to run on common use platforms. Damarel Systems solutions work in compliance with third-party management systems, Common-Use Terminal Equipment (CUTE) and Common Use Passenger Processing Systems (CUPPS). Depending on airport requirements, the software can be customized. Rockwell Collins, Inc. provides the solutions for airport self-service, baggage handling, and staff management, as well as landside operations. Rockwell Collins solutions can be easily integrated into existing systems already in use at airports. The solution is available both in the cloud and on-premise. ARINC AirDB – Rockwell Collins AODB for data storage, network integration, and information management. ARINC SmartBag, BagLink, BagMatch, ExpressCheck, and ExpressDrop – baggage handling systems. ARINC SelfServ, ARINC Automated Passport Control (APC) Kiosk – passenger facilitation solution with biometric identity management. Check-in kiosks integrate with passport reading devices, card readers, security cameras, biometric systems, and allow the travelers to tag their baggage. Rockwell Collins common use systems have multi-user system environment (MUSE) applications. ARINC Border Management Solutions and ARINC Electronic Borders – solutions for border control and customs management. ARINC AirPlan – planning and resource allocation solution. ARINC AIM Physical Security and ARINC VeriPax – security solutions. SITA is a leading vendor of aeronautical software that is used by over 1,000 airports worldwide. SITA offers solutions for airport commercial management. Airport solutions by SITA are cloud-based and cover passenger processing, border control, cybersecurity, business intelligence, airport operations, marketing, day-of-travel services, and near-field communications (NFC). SITA solutions are available in mobile mode. Airport commercial management – solutions for staff management, airport revenue management, marketing, passenger processing, data management, and business intelligence. Airport operations – SITA ControlBridge masterminds all operations from one place. This includes capacity planning, slot management, resource management, and information management (PA systems, FIDS). Baggage processing – SITABagDrop for baggage check-ins, tracking and recovery, and payments. Enterprise management – SITA Airport MSI (master system integration) monitors the construction and operations of the terminals. It includes a safety monitoring module. Information and infrastructure management – SITA’s Airport Infrastructure Management suite includes data protection mode, operational messaging, SITA Connect and SITA CyberSeciruty. Passenger processing – SITA Smart Path with Airport Self-Service Gates and barcode reader, as well as processing of biometric information and e-passport reading. 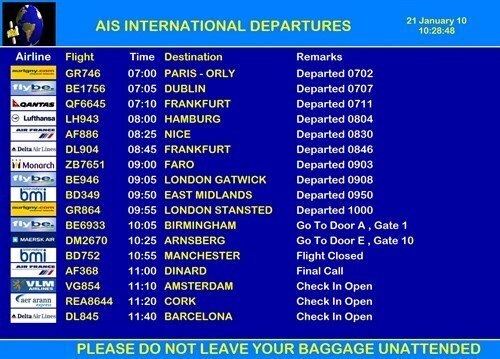 AIS offers a solution that links the information from FIDS to the airport websites. The vendor also offers its Fuel System with manual input of oil sold and sales analysis report. The software accepts carnet cards. Boarding control (Security Sentinel and Gate Guardian). Boarding control solutions support 2D barcode scanners, M1 Style Barcodes for Web Boarding Passes and S Style Barcodes for Kiosk Boarding Cards. Also, Security Sentinel allows passengers to process their luggage. Those modules have a reporting tool. AIS cooperates with AVIAVOX to provide multi-lingual flight announcements that update in real time with FIDS, and the Deaf Alerter messaging system that displays flight information for the deaf and hard-of-hearing. One of the leading providers of travel software solutions, Amadeus IT Group offers IT products for airports. Besides solutions for landside and airside management, Amadeus provides solutions for non-aeronautical revenue (passenger sales and advertising) and Airport Collaborative Decision Making (A-CDM). Amadeus offers its own AODB in compliance with the Airport Decision-Making platform. One more product by Amadeus is the Turnaround Management solution that allows tracking all processes in the airport from check-ins to ground handling operations. Also, Amadeus offers a solution for airport customer support training Amadeus Service Hub: an online hub where airport employees can find necessary information. Pacific Controls developed Converged Integrated Airport Solutions (CIAS) for airport automation. These solutions cover all airport operations, including safety and security for both buildings and aircraft. Disparate systems converge on an IP-based platform that facilitates data mobilization using open standards protocols like BACnet, LonWorks, EIB, OPC, XML/SOAP, SNMP, Modbus/TCP. The system’s flexibility allows users to add more systems in the future. German vendor ISO-Gruppe provides software with an integrated, cloud-based solution for airport management – SKYport Airport Management Suite. The solution covers air traffic management, apron handling, aeronautical billing, reporting, cargo and collaborative decision-making (CDM). SKYport has a mobile version for tablets and other portable devices. A CDM module features the management and monitoring of aircraft handling and provides a communication platform for airport staff. SKYport Business Intelligence – a module that integrates data from the billing system and creates reports. Another module for BI is SKYport BI for SAP, which creates official traffic statistics and compares the data in Web or Excel. The Business Intelligence module performs strategic planning and analyzes different scenarios. SKYport Resources – a module for allocation of immobile resource management (gates, parking positions, baggage conveyor belts). Facial-recognition and biometric ID management. Seventy-seven percent of airports plan to launch programs in biometrics ID management in the next three years. Passenger self-service solutions. These will include not only passenger check-in kiosks, automated boarding gates, baggage drop and smart tracking, but also mobile integration of airport information systems. Artificial Intelligence and predictive analytics. Airlines already use AI and data science in their operations. Almost 80 percent of airports are using them in customer service too or plan to use them in the near future as virtual agents and chatbots for advertising, personalization, airport and flight status information, and brand perception improvement. Blockchain in passenger identification. Thirty-four percent of all airports will use blockchain to streamline the passenger identification process by 2021.